Makita U.S.A. Inc. has re-launched its feature-rich website with an option to view content in Spanish. The new feature, which can be activated with a single mouse click, shows a range of makitatools.com content in Spanish including product data, service options, warranty information, promotions, select videos, and more. It is the latest in Makita’s industry-leading engagement of Hispanic contractors, who account for nearly 40 percent of the US construction labor force. This share continues to grow and Makita continues to create new ways to reach this audience through leading sales and marketing efforts: from soccer-focused sponsorships and related wearables to game-day activation, Spanish-content advertising, store events, and more. The website and the Content Management System that drives it are both built with Makita’s Emerging Markets strategy in mind. 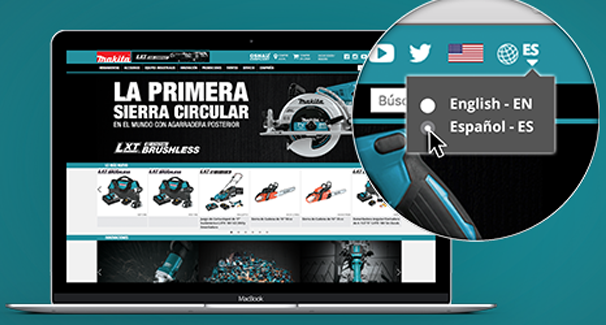 With the new option to view content in Spanish, the Makita website is a powerful resource for the full spectrum of tool users and dealers. For anyone with a Spanish-language preference, a single mouse click will re-load the site so key content displays in Spanish (and back to English, if preferred). Users can also go direct to Spanish language content with the URL www.makitatools.com/spanish or www.makitatools.com/espanol. For more info on Makita, click this link. Hurry, there’s not much time!! !